On January 27, PT Selamat Sempurna Tbk received Frost & Sullivan Indonesia Excellence 2016 Award for the three times since 2008. The award was received by Ang Andri Pribadi, Director. 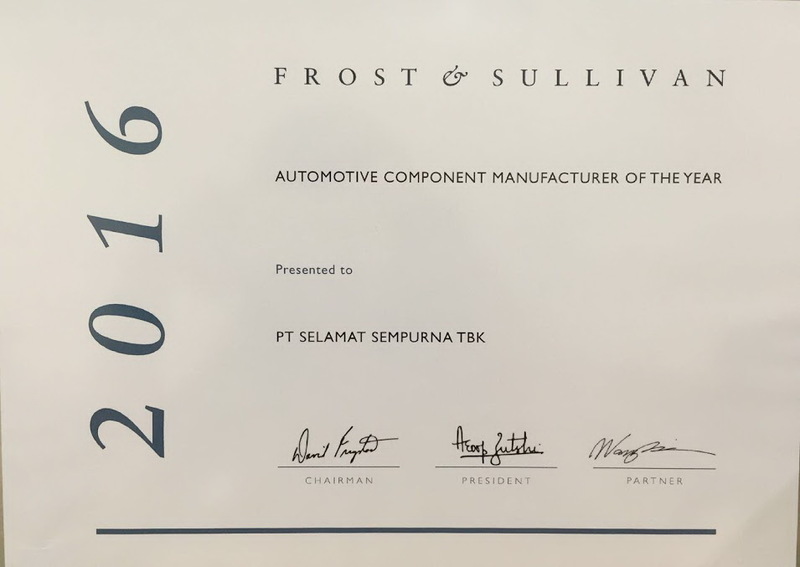 Frost & Sullivan gave five awards to the best automotive companies in Indonesia on 2016 Frost & Sullivan Indonesia Excellence Awards. PT Selamat Sempurna Tbk received the award under category Automotive Component Manufacturer of the Year, and the four other awards are: Luxury Car of The Year, Indonesia Value-For-Money Car of The Year, Car of The Year, Automotive Finance Company of The Year. Every year, this award is given based on company's performance indicators, including revenue growth, market share and growth, leading in market innovation, marketing strategy, and business growth.